Some classic designs will simply never go out of style! 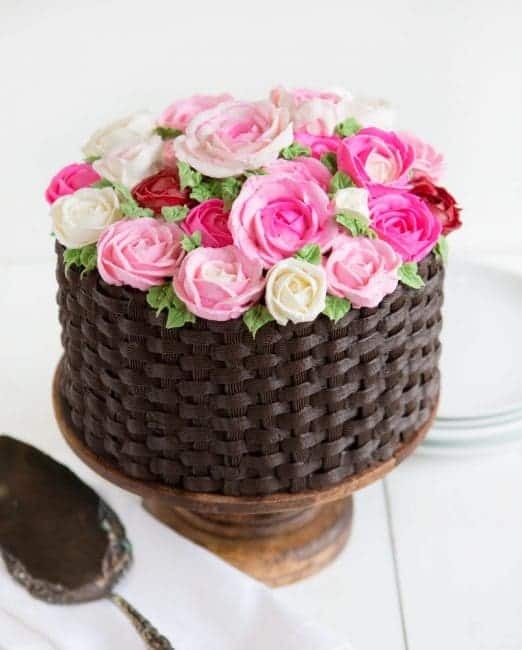 This Basket of Flowers Cake is a great way to practice some piping skills and eat delicious cake! Prepare chocolate cake. Level and chill 3 layers. Prepare chocolate buttercream and fill pastry bags. Prepare whipped buttercream. Separate whipped buttercream into 3 bowls. One will remain white, one will be tinted red, and the other will be pink. Remove about 1/4 cup of the white and tint that green. With a #104 tip, pipe out some red roses. (I only did a few) Then switch to pink and pipe out pink roses. (I did about 15) Then pipe out white roses. The double bagging method works great here, as you can remove the pink frosting and add in the white buttercream without cleaning your tip. It will add some beautiful color and depth to your roses. 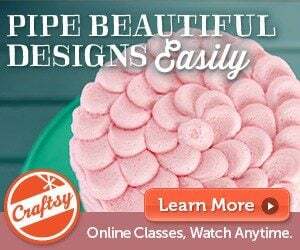 Place all the roses on a parchment paper lined cookie sheet and freeze until ready to assemble the cake. 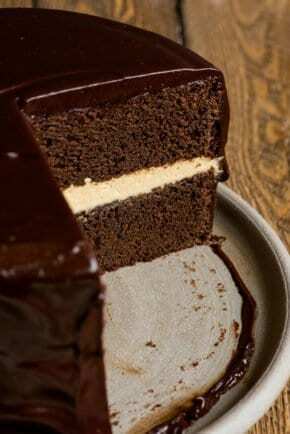 Cut off the tip of one of the chocolate buttercream bags and spread chocolate buttercream all over cake. Using a small offset spatula, smooth out the frosting. 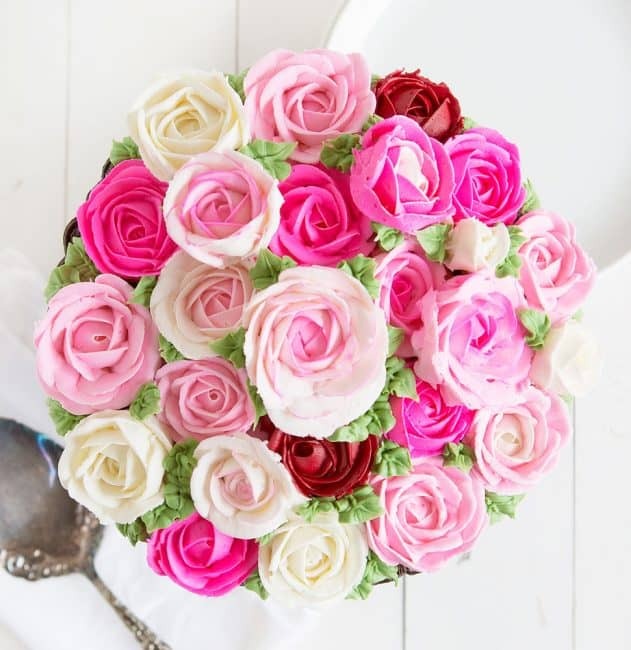 When the roses are frozen, remove them and start to place them on the cake. 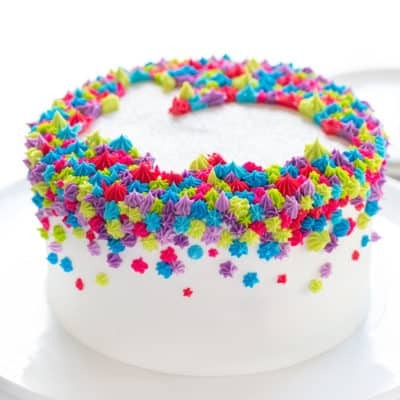 Use leftover frosting to create a higher section in the center of the cake to set flowers on. 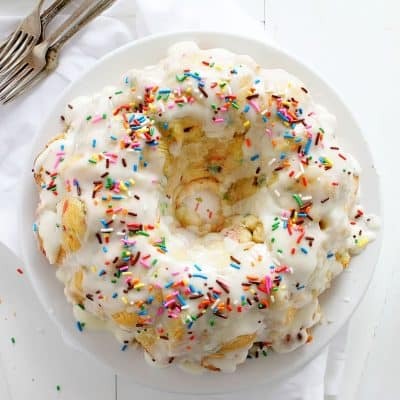 I hope you enjoy this Basket of Flowers cake. I know I had fun piping it… the basket weave is such a relaxing technique! Hi, first of all I want to say that I admire your work and creativity. Everything you make looks delicious and gorgeous. I need a good tip on buttercream!!! I live in PR and the weather here is pretty hot and hi on humidity. Sooo even though I bake and frost in a cooled (air conditioned) place my buttercream (that I make following every single detail of the instructions) does not stay in a firm consistency. When I put it inside the pipping bag in a matter of 2 to 3 minutes melts and of course I dont get to create any designs or shapes. I’ve try using cold buttercream instead of soften, and it delays the melting a little but no more than that. 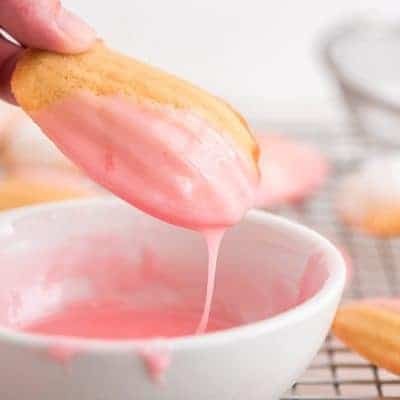 I’ve never taking any class on cake decorating all I know is by watching tutorials and reading on the web so I dont know if there’s any correct way of hoding the pipping bag so that my hand is not making the buttercream soften while Im working with it? 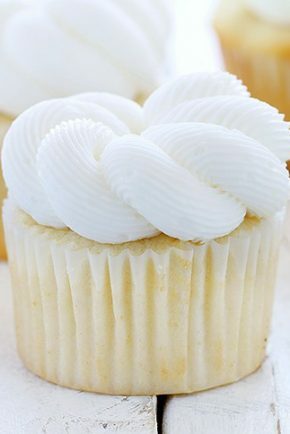 So please Can you give me any advise (if any) that can help me get the perfect buttercream consistency. I will really appreciate any responce. freezer. For a little while. my hands were to hot and I would melt the Frosting. It worked for me. I would try talking to people in your area who use frosting, and who are familiar with your climate and humidity conditions. Also, try searching the internet for answers. 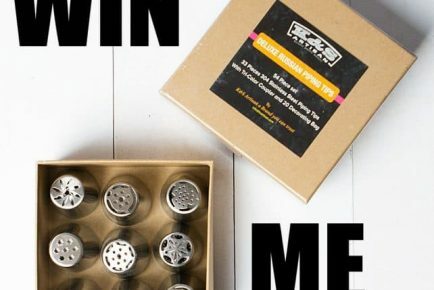 The King Arthur Flour company has answers to a lot of baking questions. You can call or email them, but they are in a cooler climate (Vermont). There are a lot of books about frosting at Amazon.com, books. Look for books by Toba. I believe she is in a warmer part of the country, at least during the summers. Maybe you need a new recipe to try! Go to the Wilton website, and they should have a recipe using shortening, like Crisco. That should be more stable in the heat than butter. 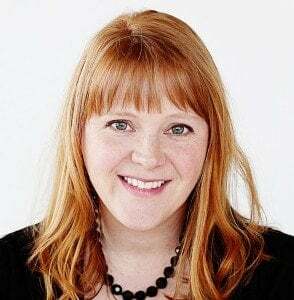 Send Wilton an email, and see if they have any answers for you. Possibly you could use a larger part of shortening, and less or none of the butter. You may have to sacrifice some natural flavor to get the stability you want. Amanda might have a better answer to this question! 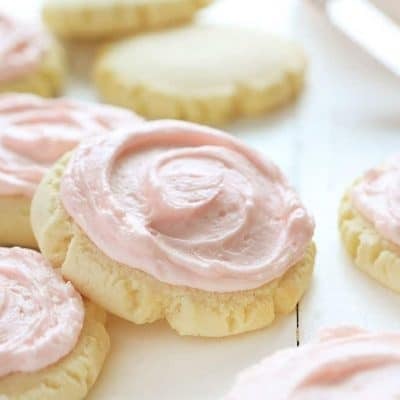 Some people keep a bowl of ice water next to them and periodically dip their hands, then dry to keep them cool enough as to not melt the buttercream. 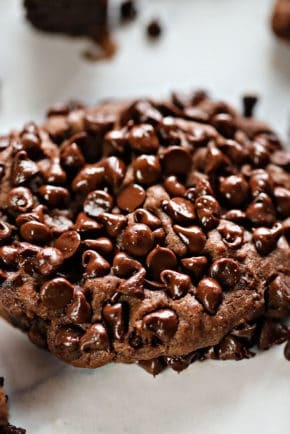 You can also try to stabilize your frosting by adding 1-2 tablespoons of meringue powder to your recipe. I’ve also heard others say they used 1-2 tablespoons of instant pudding to stabilize theirs. That way it holds its shape better and is less prone to melt. Wow!! It looks like you made a basket and put flowers in it. 🙂 I was surprised to see it was a cake!! 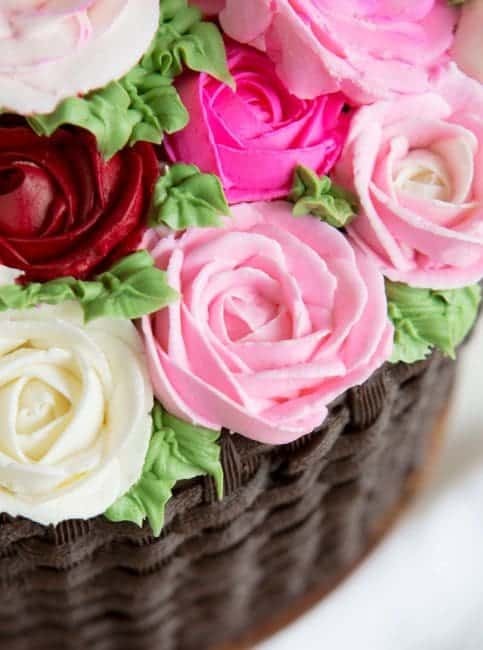 The roses and leaves look so real and so does the basket of the cake!! You are what I will call you ‘An Artist Baker’. You are great at this. Send me more of cake recipes. 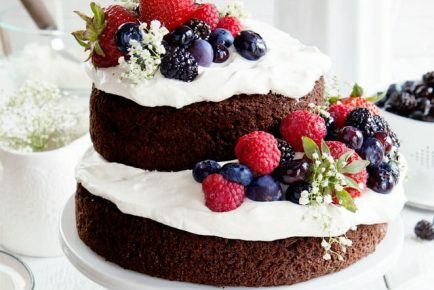 I want to make a homemade cake on my birthday, June 21. Todo muy bello. Agradecida con contar con sus conocimientos. Gorgeous!!! 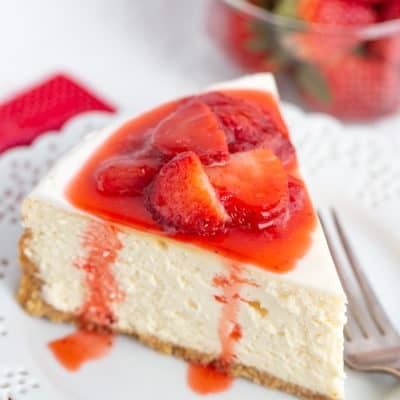 I would love to make this but where did the video go?? How do you get the flowers so big without them sliding off the flower nail? I’m making just putting mine together and I have a ton of smaller flowers which looks kind of messy compared to your beautiful arrangement. Maybe try a larger nail? I can’t wait to try and make the Moon and basket of flowers cakes for mother’s day and for a birthday coming up 🌙🌛🎂 thank you for everything and I look forward to seeing more of editorials on the cakes and more. 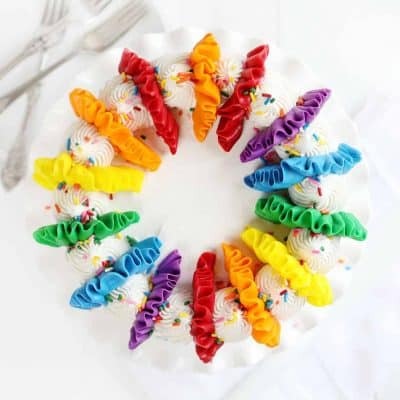 Hi, just wanted to ask how long the buttercream roses can be kept in the freezer? 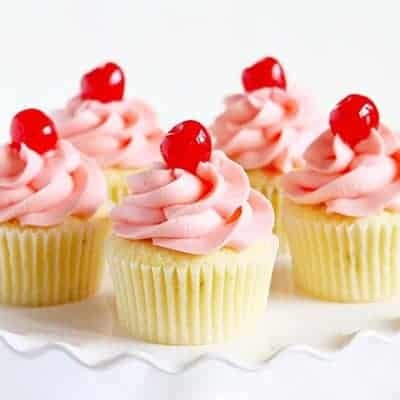 Cake bakers have a large number of frostings to use for specific purposes, many of them variations on buttercream. 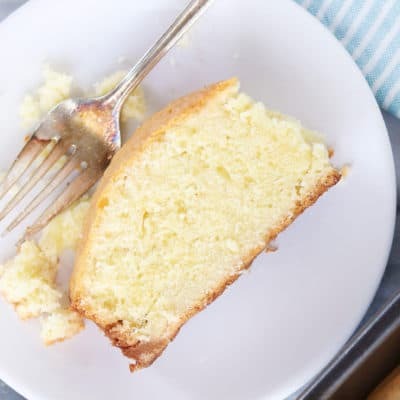 The simplest version of buttercream simply calls for the butter to be whipped with powdered sugar and flavorings, yielding a relatively stiff product called “simple” or “American” buttercream. 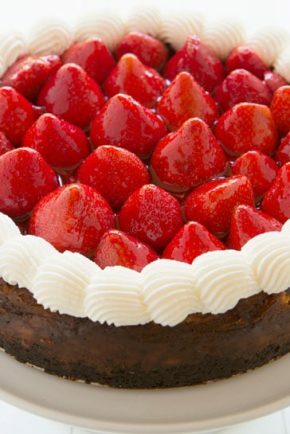 It’s smooth and soft enough to spread evenly over most cakes, yet stiff enough to hold its shape readily when piped into decorations. Adding meringue powder to the mixture along with the powdered sugar makes it sturdier and more versatile.